I typically prefer to read books in their traditional print format, but over the past few years I have become more willing to explore other formats on occasion. 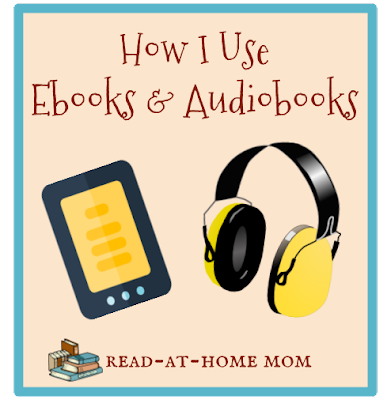 Today, as Armchair Book Expo delves into diversity, I want to share how I use ebooks and audiobooks. Reading digital ARCs. I first started reading ebooks regularly when I started blogging in 2011 and joined NetGalley. Back then, I read on a Nook. Now that my Nook is long-dead, I either use the Kindle app on my Android phone, or I read in Adobe Digital Editions on my laptop. I have come to prefer Edelweiss over NetGalley, and I read far fewer ARCs now than I have in the past, but it's still nice to be able to carry an entire library with me without weighing down my purse. Downloading hard-to-find library books. If a book is unavailable in print from my local libraries, or there are many holds on the print edition, sometimes I will download the book through Overdrive or one of the library's other ebook portals just in the interest of gaining access to it quickly. Discovering new and old favorites on OpenLibrary. Internet Archive maintains an amazing database of scanned books, including many vintage kids' books, at OpenLibrary.org. These can be downloaded in .pdf or .epub format, or read directly from the website. This has been a great source of lesser-known titles by favorite picture book authors and illustrators, and OpenLibrary's titles are the only ebooks I will read to my kids, because they have the look of the real book, including marginalia and library markings. Previewing picture books. The last way that I use ebooks is to preview certain picture books. I tend to be skeptical of popular picture books, so before I go to the trouble of tracking down a print copy, I will check to see if I can download a digital copy and get a taste for the story. If I don't like it, I don't bother putting the physical copy on hold. If I think it has promise, I'll track down a print copy to read all the way through and share with my kids. Traveling. If I have to sit on a bus or a train, I will download a bunch of audiobooks. I don't always concentrate that well, so I try to make them books I've read before so I can drift in and out. When my kids were a little bit younger and would nap consistently in the stroller, I also used to listen to audiobooks while walking with the stroller. I got a lot of extra reading done that way last summer! As a family we also listen to audiobooks on car trips. My husband usually chooses, and I have found quite a few new favorites this way. Reading nonfiction. I am not very good at reading nonfiction on the page, so if there is a factual book I want to read, I'll try to get the audiobook edition. Audiobooks always slow me down, which is frustrating with fiction, but really necessary for me to do if I am going to comprehend nonfiction. I figured out that this would work for me by listening to podcasts. I realized I enjoyed the content when someone read it to me, but not as much when I had to work through it myself. Getting into books more easily. If I'm having trouble getting started with a book, sometimes it helps to listen to the first chapter or so instead of reading it myself. This helps immerse me in the world of the story and in the author's writing style, and it sometimes makes it easier for me to pick up the print copy afterwards. I will also sometimes listen to an audiobook if I need to finish a book (for a challenge or a discussion or something) but am struggling to enjoy it. Are you an ebook or audiobook reader? What do you like (or dislike) about these formats? Funny, I use eBooks and audiobooks, but with differences from you. I don't like reviewing from eBooks, especially for picture books. But I do love eBooks for travel or when I'm out and about. This year I took a Kindle everywhere at DisneyWorld and read during downtime. I use audiobooks when I'm exercising, doing chores around the house, or driving. But I don't care much for nonfiction audio - I want stories. For nonfiction, I want to spend more time, and I like the physical book. Some weeks when I am really busy I only have time to read audiobooks, so I'm very grateful to have them! Wonderful post!! I really enjoy the ease of reading ebooks! Especially when it is an honest review and I find myself marking a bunch of sections to go back to for my review. I also enjoy audiobooks, but I definitely don't love them. I'm SO picky about the narration. If I don't like the narrators voice or I can hear the noises of their mouth moving (does that make sense?) I will immediately turn it off.